Greenwich Idol Overload ~ Philippine Freebies, Promos, Contests and MORE! Can't get enough of American Idol? Join Greenwich Idol Overload for a chance to see the Idols including your favorite judges, JLo, Randy Jackson and Steven Tyler in person. Simpy buy any selected Greenwich Overload products, either dine-in, take-out or delivery and get a coupon with a special code. Text in IDOL [coupon code] and send to 2600 or enter it via Greenwich Pizza FB page for a chance of winning a FREE trip for two (2) to Hollywood and watch the American Idol Season 11 Finale live! 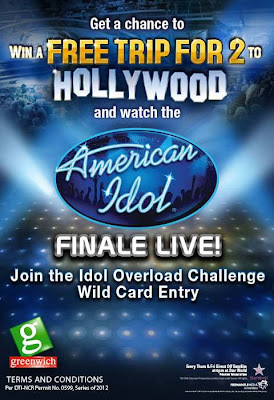 Go to Hollywood and watch American Idol Finale live!